We’ve all been there: That dentist appointment you knew was coming up slipped your mind or didn’t quite get planned for correctly; whatever the case, you get that sinking feeling that comes with knowing you’re going to be late. What do you do? What happens? How does this influence the dentist’s office? Today, we’ll take a look at this multi-sided issue that seems to be an unavoidable, ever-present component of the medical field. There are so many ways to look at this simple, seemingly harmless mistake, but we’ll do our best to take every side into account as fairly and honestly as possible. Plus, we’ll even provide some tips and best practices for what to do about chronic or one-time lateness! First and foremost, we want to be fair to everyone involved. With that said, everyone’s time is valuable, including the patient that is late, the patients that are waiting for the next appointment slot and beyond, the office staff, and, yes, even the dentist. Everyone involved is operating on a schedule for their day and certainly is not looking forward to any delays in that schedule. The patients sitting in the waiting room don’t want to be forced to wait beyond their appointment slot, the reception staff doesn’t want to rush through necessary paperwork, and dentist and patient alike certainly don’t want to rush through the planned procedures. Nobody benefits from a missed appointment, except maybe the person that follows it (if they’re early enough). It is unlikely that a dentist will be able to fill a missed appointment by getting through each other patient quickly enough to add in any last-minute requests. 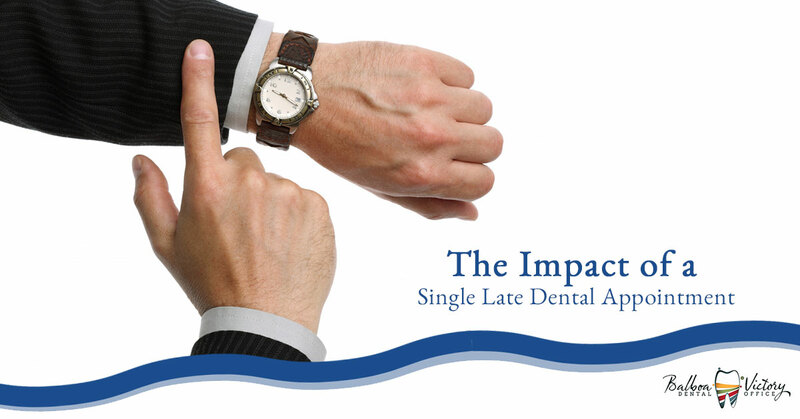 Likewise, a missed appointment requires the patient to reschedule with a new date and time to keep track of, then make plans and accommodations to attend that appointment; they also still haven’t been able to see the dentist or get the planned work performed, which can lead to more problems. Because of this, it is easy to think that business is business, and a dentist should do everything they can to take a late appointment. After all, the dentist will likely lose revenue equal to the appointment cost if they simply reschedule the appointment. This type of thinking can be argued for, yes; it can also be argued against, as pushing back subsequent appointments for the day to see a late arrival can cause those patients to get frustrated and leave or face their own scheduling conflicts. Basically, seeing a late patient, especially if that time commitment bites into other appointment slots, can cause the dentist’s other patients to experience the same type of discomfort the late patient was trying to avoid, which can cause the dentist to lose more than just their trust. Call and let the office staff know that you’re going to be late and give them your best possible guess as to when you can make it to your appointment. Ask them right then if it is better if you just reschedule or continue to try to make your appointment. Avoid the anxiety of “coming up with a good story.” The dentist’s office isn’t your boss and they aren’t here to penalize you for your oversight or the traffic collision that kept you from your appointment, they just want to help you and other patients see the dentist. Just be honest and give them a clear idea of just how late you are! Be understanding if the staff requests you reschedule; they’re only looking out for your health and safety by ensuring that the dentist has the time they need to perform the scheduled service, while also looking out for the patients that will be forced to wait beyond your appointment slot if it were done as intended today. Please, please, please do your best to make it to your appointments on time or a little early. Actually, being early may get you in much earlier if you are able to take the appointment slot that was missed by the patient before you! Always attempt to find out where they are, when they will arrive, and make a decision based upon that information. Whenever possible, attempt to “bump up” a later appointment and see if the patient is flexible enough to reschedule into that day’s rotation – remember, they still need a procedure completed! Be considerate of your dentist and their patients alike, you serve as the bridge gatekeeper between the two. Try to do what is best for both parties whenever possible! Whenever you have to reschedule a patient, make it clear to them why you have to stick to your schedule and that rushing through their planned procedures is not in their best interest. Be sure to kindly explain everything and ensure they feel supported in making their next appointment. Ultimately, there is no perfect solution for most late or missed appointments. Rarely, it is possible to shuffle the rest of the day’s patients around to get the late patient seen the same day without disrupting the schedule, but all too often dentists and their staff are forced to skip lunch or waste time waiting around for patients that didn’t show up to their appointment; worse still, many patients become frustrated or mad when they can’t be seen even after calling to let the staff know they would be late (which really doesn’t help solve the problem at all). Often, this a lose-lose situation. Our best piece of advice? Keep your appointments whenever you possibly can and be flexible with rescheduling and apologize whenever you cannot! Get in touch with the friendly staff at Balboa Victory Dental with any questions you may have about our dental care, practices, and even our rescheduling policies – we love to answer those questions! At the end of the day, our entire staff just wants to assist your family find the dental care that is best for you, so we’re truly happy to help in any way.